Have you ever looked at the Olympic world records from 1924? I know you’re here for a good ol’ CI/CD tools throwdown, but hear me out. If you compare the 1924 records to those from 2016, those Olympians wouldn’t even make their national teams. That’s how much better, faster, and stronger athletes are today. Results of the Men’s 100m spring from 2016 US Olympic Trials. Most of this improvement is the result of better performance techniques and practice regimens. Here’s where we get back to CI/CD: the old way of deploying software is like a 1924 Olympian trying to compete in the 21st Century. There’s no chance of success. You’ll be left in the dust. Continuous Integration and Continuous Delivery are best practices for software deployment today. These techniques help you deploy better software faster, with fewer errors, and a quicker feedback loop. It’s a win-win-win for the company, customers, and developers. All that’s needed is a set of tools to make it happen. 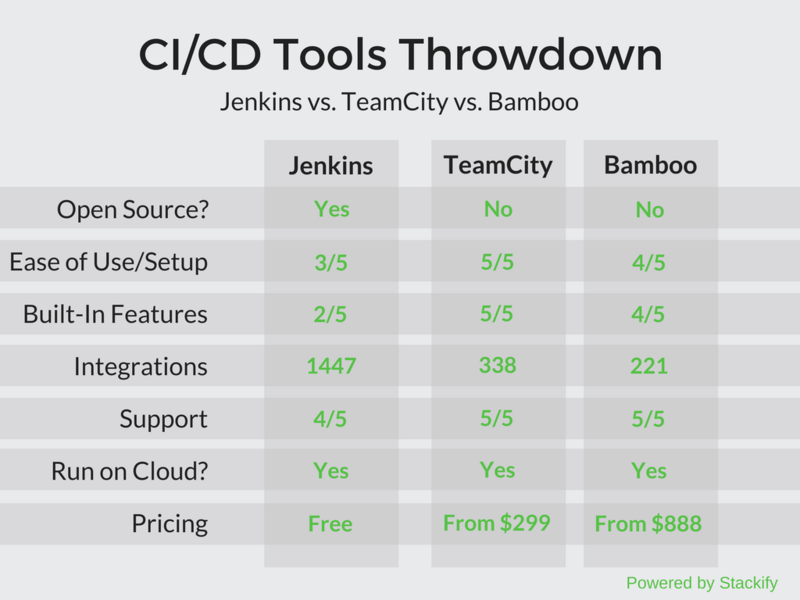 We’re going to look at 3 of the top CI/CD tools on the market today: Jenkins, TeamCity, and Bamboo. By the end of this article, you should feel confident selecting a tool for your team. If you already use one of these tools and looking to make a change, this article will provide you with the insight needed to make the right decision. Before we get into the throwdown itself, let’s briefly cover the basics of each tool. Bamboo is a CI/CD server from Atlassian. Like other CI/CD servers, Bamboo allows developers to automatically build, integrate, and test source code, then prepare the app for deployment. Bamboo also works seamlessly with Atlassian’s other tools like Jira (project management) and Hipchat (team communication). Ladies and gentlemen, prepare yourself for the main attraction. It’s time for these CI/CD tools to rumble! We’ll look at the most important attributes of CI/CD, and see how these tools stack up. By the end of this section, you’ll know exactly which CI/CD tool is right for you. Before we look at what makes these tools different, it’s important to point out how they’re similar. Ok, enough of the niceties. Let’s rumble! TeamCity takes the cake for ease of setup and use. It’s known for its out-of-the-box usability, particularly its secure default configuration. It also has a gorgeous UI that makes it even easier for CI newbies to get caught up. Bamboo is comparable and in its ease of use, but the UI is not quite as pretty, and G2 Crowd ranks TeamCity higher than Bamboo for “Ease of Setup”. Jenkins falls short of both TeamCity and Bamboo in this category. Jenkins’ UI is a little more old school, but the new Blue Ocean interface was a major upgrade. Still, the open source software comes inherently with lower usability and ease-of-setup. TeamCity comes stacked right out of the box, with excellent build history, source control, and build chain tools. Bamboo has less features out of the box, but integrates natively with the rest of Atlassian’s tool stack. This makes Bamboo feel more feature rich without possessing the features itself. 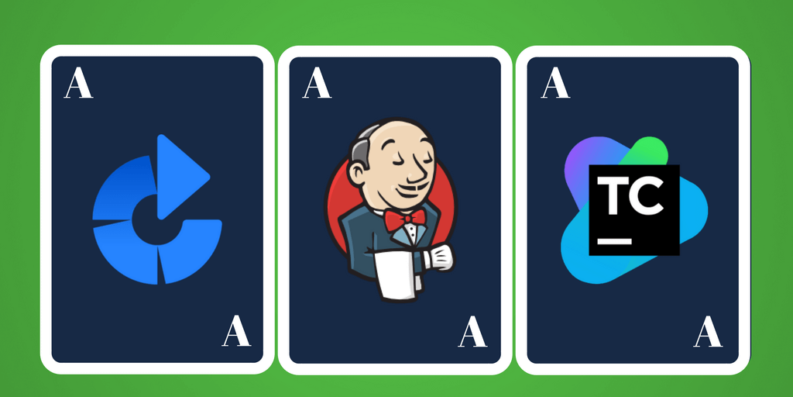 Jenkins is the most feature-sparse tool of the three, but it makes up for it with a vast plugin ecosystem, as we’ll discuss next. The competition isn’t even close when it comes to integrations and plugins. Jenkins has a massive ecosystem of plugins, giving it unprecedented customization and extensibility. Bamboo and TeamCity are slowly growing their ecosystems, but at this rate, they will probably never catch up. As an open source project, Jenkins has a large, helpful community of contributors that provide support to one another. As such, Jenkins has extensive documentation, but you’re left to comb through the docs yourself to learn or solve a problem. Bamboo and TeamCity, on the other hand, offer professional support from their parent businesses as well as growing user communities. Bamboo and TeamCity users will find a nice mix of hands-on support from corporate as well as crowd-sourced support from the community. Many small-to-medium size software teams run exclusively on cloud infrastructure. So it was baffling to some Bamboo users when Atlassian discontinued Bamboo cloud, forcing teams to run it on-premise. They replaced the service with BitBucket Pipelines, but many feel it isn’t a perfect replacement. Jenkins and TeamCity are still available to run on cloud servers. Bamboo is the most expensive of the tools. It starts at just $10, but offers an extremely limited experience for this price. For the whole experience, you’ll have to license Bamboo for a one-time cost of $880 for 1 remote agent. Clearly the winner of this throwdown is a toss-up. To choose the right CI/CD tool, you’ll need to take a hard look at your budget, your internal resources, and the the amount of time you want to spend on learning and setup. If you have a DIY attitude and want maximum functionality, then Jenkins is probably the tool for you. If you prefer an easier user experience and a tool that integrates with your existing tech stack, then check out Bamboo. For a beautiful interface and great out-of-the-box functionality, TeamCity is the way to go. Remember that your CI/CD tool is just one of the tools you’ll need to win the race of software development. Deployment and application monitoring are equally important elements of agile development. Never settle on the process you have; keep exploring for ways to upgrade your techniques and practices.